Why until now there is no such analysis? First, it is necessary to collect a huge quantity of information. Second, a group of analysts into which should include experts on the nuclear physics, physicist of plasma, thermo physics and some other is necessary. Third, the theory about star and the Sun structure has become outdated and mismatches the validity, means, it is erroneous. Hence, the analysis of all the data collected, based on the erroneous theory, will be erroneous. Fourth, because of the existing mistake in the theory about the Sun structure, researchers do cannot understand the value of data available to them about a star and «a solar wind», and the actual information this data carries. Let’s try to correct almost hundred years old mistake in the theory of the Sun structure. According to still considered as modern theory, the Sun is consisted of a kernel where under the weight of the top layers there is a thermonuclear synthesis of kernels of hydrogen in kernels of helium. At the process of thermonuclear synthesis, in a kernel of the Sun, energy is allocated. This energy, having passed radiant and convection zones, is transferred into an atmosphere. In the top layers of an atmosphere of a star, under the action of variable magnetic field, particle, kernel of atoms, ions and electrons are being thrown out in a space. The speed of the thrown out particles is high and different. Being based on such theory, the value of the parameters of «a solar wind», are not valuable for reception of additional knowledge. Luckily for us, the Sun, as well as the whole Universe, wasn’t created by the authors of these theories, but by much higher mind on many, therefore, we suggest to consider other theory of stars structure on an example of the Sun. 6. 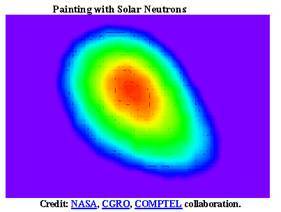 The chemical compound of «a solar wind» does not coincide with a chemical compound of the Sun. 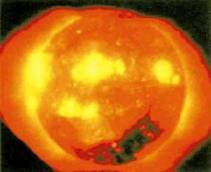 In the chemical compound of the Sun all the elements of the periodic system appear, including uranium. The chemical compound of «a solar wind» includes elements from hydrogen up to nickel and zinc.